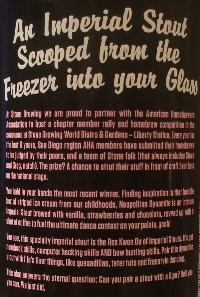 Brewer Description: (from bottle) An Imperial Stout scooped from the freezer into your glass. At Stone Brewing we are proud to partner with the American Homebrewers Association to host a chapter member rally and homebrew competition in the commons at Stone Brewing World Bistro & Gardens – Liberty Station. Every year for the last 8 years, San Diego region AHA members have submitted their homebrews to be judged by their peers, and a team of Stone folk (that always includes Steve and Greg, natch). The prize? A chance to strut their stuff in front of craft beer fans on the national stage. You hold in your hands the most recent winner. Finding inspiration in that humble box of striped ice cream from our childhoods. 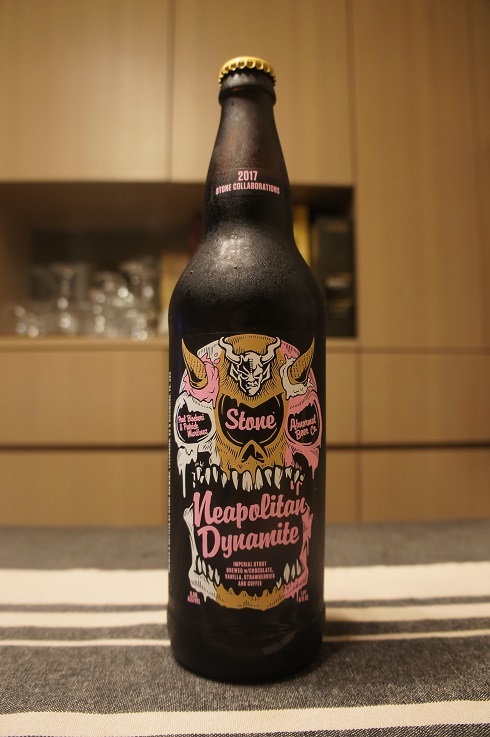 Neapolitan Dynamite is an intense Imperial Stout brewed with vanilla, strawberries and chocolate, revved up with a shot of coffee to fuel the ultimate dance contest on your palate, gosh! 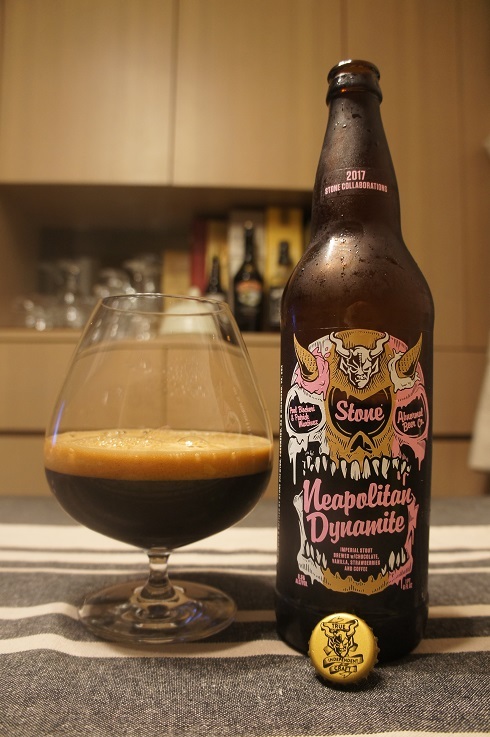 You seem this specialty Imperial Stout is the Rex Kwon Do of Imperial Stouts. It’s got nunchuck skills, computer hacking skills AND bow hunting skills. Pair this dynamite stout with life’s finer things, like quesadillas, tater tots and freestyle dancing. This also answers the eternal question: Can you pair a stout with a liger? Hell yes you can. We just did. Intro: A 22 fl. oz. bomber with a bottled on date of 25th August 2017. Poured into a snifter glass. Appearance: Black in colour with a nice one finger brown head that had decent retention and left some spotty lacing. Aroma: Coffee with light melted and mixed Neapolitan ice cream. Taste: Lightly sweet beginning as coffee dominates followed closely by vanilla and roasty malts. The strawberry and chocolate are lurking around in the background before a finish that is lightly bitter from the coffee. Mouthfeel: Creamy, medium bodied with low carbonation. Overall: This was quite nice but not quite Neapolitan enough for me as only the coffee and vanilla dominates the aroma and flavours while the strawberry and chocolate were not strong enough. I’m a big fan of mixing melted Neapolitan ice cream, so that was what I was hoping for. Body was also thinner than I hoped for, but not too much of a problem. I may seem a bit overly critical here, but it really is quite good and enjoyable.